You can read below a short interview with Bernd Grünwald, one of the persons responsible for Kaltenbach Open Air festival. You can find out more about this year edition, line-up, history of the festival and other infos from behind the scenes! You can read today an interview with the German band Crematory, a band with a long activity on the metal scene. “Infinity” is their latest release – more about it, about live concerts, the evolution of the metal scene in the last 20 years and many more you can find out by reading the interview below! We have today some very special guests from U.S. Please welcome Arms and Sleepers! The guys have finished an US tour and they are getting ready for the European Tour that will start on May 5th in Vienna. You can find out below more info about the bands music, creative process, concerts, the condition of music in the 3rd millennium and many moore! We have again some guests from Finland. This time Marko Saaresto, the singer of Poets of the Fall was the one who responded our questions. The guys have a new album, a new video and good music like always. You can find below the complete interview. Hello Krister and thanks for taking some time to respond our questions! Hi there and thanks for noticing us! Could you please make me a short description and history of Rockstad:Falun? How the idea appeared, how many editions had the festival so far? Well, me and Pär from Sabaton wanted to do a special Sabaton-show back in 2008 and we invited som local bands and made the first issue of Rockstad: Falun a total success when we sold out the venue (1600 tickets) and went through the night wit no problems or other negative stuff. After that we decided to make the Rockstad: Falun festival an annual event and we started the plans for 2009 within a few weeks after the premiere. 2009 we went outside to do an open air 1-day festival, everything went out good but we had 4 days of heavy rain during that weekend so we didn’t manage to get more than 3000 people out Anyway, we made very early plans for 2010 and said that we booked sunshine for this upcoming event! Can you give me some more details regarding this year’s edition? Important things for the participants? I think the most important stuff in this years edition is the bands playing.. We have taken a huge step up this time and have a bunch of great bands playing. Already we have 14 nations confirmed to visit us and the ticket pre-sale is going just great. We have 5000 tickets out and it might be sold out before the festival starts so I’m very excited! 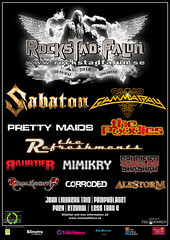 Rockstad: Falun 2010 has Gamma Ray and Sabaton among other bands. How many people do you expect this year to participate at the festival? Falun is also the hometown of Sabaton. They played last year at the festival and this year also. It’s a special relation between you and the guys? Yes, i have worked along with Sabaton for a few years and they all are my personal friends. Joakim & Pär are also co-owners in Rockstad: Falun and we aim for the same goal with all projects we handle. You had some problems with finishing the festival-camp area. What were the causes? The main cause was that our organization is to small to handle such a big project at the moment. We don’t want to take a big chance and risk anything, or to deliver a bad solution for a festival camp. Security in a festival camp is very important and we simply couldn’t get all thing in place this year. …Festival camp for 2011 will be main priority! How important is Rockstad for the city? Do you have many participants that come from different parts of the country? Falun really needs this kind of festival. The interest for heavy metal music in this area of Sweden is big and this town don’t have any other alike festivals so we thought that we just had to arrange a great thing. The city hall loves this idea and we have a lot of support from them and a bunch of other companies and organizations. We have like 60% from the local area and the rest comes from other parts of Sweden along with 14 (as i write) countries. We have confirmed visitors from both USA and Australia, and that is just so cool! Thank you and welcome to visit us anytime mate! Kevin Codfert (keyboards – Adagio) has been interviewed by us regarding the activity of Adagio, the upcoming tour with Kamelot, future plans and many more. The band last album, “Archangels in black” was launched one year ago (February 2009). 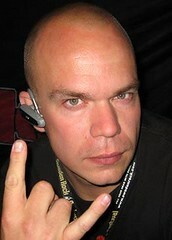 The interview was made a few days before the band announced their split with the vocalist Christian Palin.